Recently I saw a "recipe" on Pinterest for a Candy Corn Peanut snack. Put candy corn and peanuts in a bowl, mix. I remember laughing that someone would actually write out such a simple recipe, and especially that someone would bother to pin it. Well, I've gone and done it myself. This is so simple that someone on Pinterest will probably laugh at me. Oh well, it's worth it. I served these at Andy's birthday party recently and they were a huge hit. They're so easy to make and such a crowd pleaser for any gathering big or small. They flew off the plate and I wished I had made more! Summer on a stick. 1. Assemble all ingredients except balsamic glaze as shown in photo. Arrange on a platter. 2. 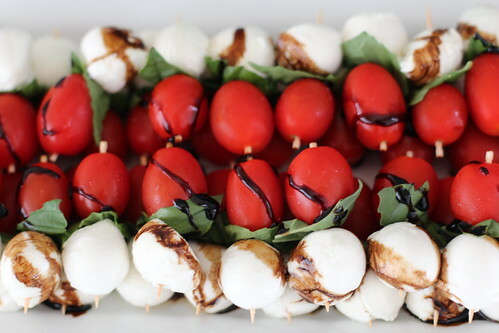 Just before serving, drizzle balsamic glaze over skewers. These bites had the perfect texture and tasted SO good too. My search for a yummy caprese bite is now over, so thank you so much!